By default, invoice emails contain a link for your customer to pay their invoice online through Fergus Pay. Here, they can also preview and download or print their invoice. You can automatically attach a PDF copy of the invoice to your emails through the following Settings. If you would like all customers to receive PDF copies of their invoices as well as a link to pay their invoice online, hop on over to ⚙️ Settings > Invoicing and tick Always attach invoice PDF to emails even when Fergus Pay is enabled. This option is great for property managers, and allows you to keep the payment link front and center so you get paid faster. 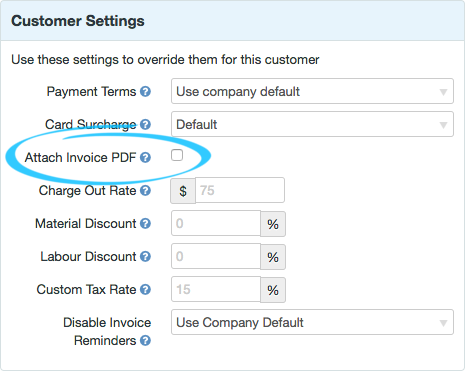 Hop on over to the Customers page and find the customer you'd like to enable PDF invoices for.